My children love frosted cakes. It’s easy to freeze and very handy when unexpected guests come. But when we wrap it before freezing it the beautiful frosting sticks to the wrapping paper. It spoils the beauty of the frosted cake. Here is a tip to avoid this disaster. 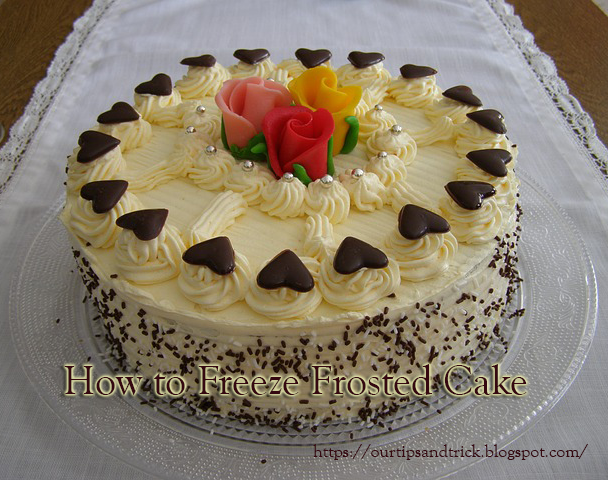 First, put your frosted cake in the freezer without any wrapping. When the cake is frozen, get it out and wrap it. The frosting won't stick to the wrapping paper. Put it back in the freezer. When you want to use the cake, take it out from the freezer and enjoy. Do remember to remove the wrapping before thawing your cake. This way the beautiful frosting won’t get spoiled and you will get appreciation from your guests. Share with your friends if your get this tip useful. Thanks a bunch for liking my share.. have a nice day. I am so sharing this simple tip. Why haven't I thought of this before??? Thanks a million for liking and sharing my tip.....Have a nice day. Excellent tip! Now I just need some cake! I mean, I have to try this out, don't I? Great tips, you definitely don't want to mess up the pretty decorated icing! Great tip. Thank you for sharing. With two teens in the house, cake doesn't stick around long enough to freeze! But this is really a good tip - thanks for sharing! What a great tip! Thanks for linking up to Awesome Life Friday!